There wasn’t a chance I would miss Fedor Emelianenko’s Bellator Heavyweight Grand-Prix tournament final fight against Ryan “Darth” Bader. It was quite possibly one Emelianenko’s last fights and it was for a major mixed martial arts title at the tail end of a storied career for “The Last Emperor” (38-6), who is without question one of the greatest mixed martial art fighters to ever live. The final fight of the night kicked off with the national anthems of both Russia and the United States honored, with an exceptional performance of The Star-Spangled Banner delivered before a ruckus patriotic crowd not shy about showing their support for the American Ryan Bader (27-5). For a brief moment in time, a very real Rocky IV Russia vs the United States atmosphere was captured in a quite honestly top-notch performance from the Bellator production crew and fortunately for everyone but the 42-year-old Emelianenko’s camp the following action inside the cage would not disappoint either. The fight was violent and over fast, 35 seconds fast, and unfortunately for the legendary Russian Fedor Emelianenko it was not meant to be Saturday night as Ryan Bader cleaned “The Last Emperors” clock with a savage left hook that dropped the Russian where he stood in his tracks. Hurt badly, Emelianenko was quickly swarmed by “Darth” Bader before referee Mike Beltran rushed in to save the legendary Russian heavyweight from any further punishment. Emelianenko appeared busted up in his corner, having been caught flush by Bader who claimed the vacant Bellator heavyweight title by TKO and who is now the Bellator heavyweight Grand-Prix tournament finals champion. Bader is now the first Bellator two division champion, simultaneously holding both the light heavyweight and heavyweight titles and cementing himself as among the most elite fighters in the sport today. Bader was a class act during his post-fight speech, praising the Russian legend and paying respects to one of the great champions of our time. 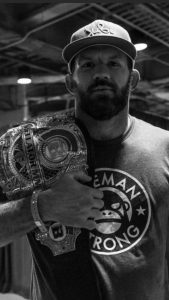 It’s hard not to recognize just what kind of exceptional performance Bader has put on not just throughout his Bellator tenure, but really throughout his entire career. Bader has an incredible record, having lost only to the most elite fighters in the sport today. A victory over Emelianenko perhaps the greatest triumph in a storied, elite mixed martial arts career in his own right. In other action Saturday night, heartbreak came to Aaron Pico (4-2) at Bellator 214, where the young mixed martial arts sensation was upset by the surging veteran Henry “OK” Corrales (17-3) who has now rattled off five straight victories and whom is now calling for an opportunity to rematch Patricio “Pitbull” Freire for the 145-pound Bellator featherweight title. Corrales was in trouble early, blasted by Pico with an upper cut in an absolute shootout but the veteran mixed martial artist would not be denied and fought back from adversity to separate the young 22-year-old Bellator prospect from consciousness in what is perhaps the biggest victory of the 32-year-old MMA Lab veterans’ career. Prior to Saturday night’s loss, Pico had rattled off four straight victories by knockout or technical knockout, relying on his boxing background to bring the fight to his opponents in violent, fisticuff fashion despite being an elite wrestler who tried out unsuccessfully for the 2016 U.S. Olympic team. Pico may have gone out on his shield Saturday night, but when a fighter chooses to go to war and bring the violence as Pico does, he cements a reputation for himself as a striker to be feared and respected in the cage. In a sport where fighters have a lot of tools and options at their disposal, choosing to actively engage in a blitzkrieg like fashion guarantee’s he is a fan favorite and sure to be invited back to the big stage to compete again. Even in defeat, Pico makes my all-violence first team for being a game fighter willing to give the promotion and fans what they want to see. With legendary boxing trainer Freddie Roach in his corner Saturday night, Pico is in good hands and is sure to bounce back from Saturday nights disappointing loss to continue down the road of professional mixed martial arts prize fighting where anything can and often does happen. In other news Saturday night, former WWE wrestling champion Jack Hager (Jack Swagger) took home his first professional mixed martial arts victory against the 41-year-old J.W. Kiser (0-2), winning by arm triangle choke submission in the first round at The Forum in Inglewood, California. A smaller heavyweight at 6’0, 220 pounds Kiser displayed good footwork in the cage and sprang like a Jack in the box in an attempt to flatten the larger Hager (1-0), but in the process allowed the former WWE star to cut off the cage. This tactical mistake turned out to be a very bad idea against an opponent with legitimate amateur wrestling credentials in Hager who was a two-sport athlete at the University of Oklahoma in both football and wrestling. Inevitably, Kiser was taken down and hit with some massive elbows which opened up the finishing arm triangle choke submission.